80% of the booking is charged after booking and is non refundable 4 weeks prior. Youth or University groups need to be supervised by an adult. Maynooth Campus Conference & Accommodation is a mixture of modern student apartments on the North Campus and traditional South Campus rooms on the university campus at Maynooth, west of Dublin city. Maynooth is a lively university town of some historical interest. At the gates of the college stands the Geraldine Castle, once the seat of power in Ireland. 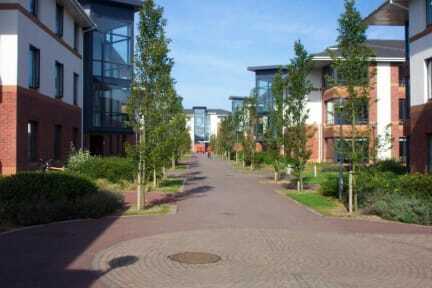 The tree-lined main street links the entrance to the college with Carton walk and the great Carton demesne. The town also has an excellent range of restaurants, pubs and shops. On the campus visitors can enjoy fine Georgian and neo-Gothic architecture, as well as the magnificent College Chapel. There are also splendid walks amongst the extensive grounds. And all within easy reach of the attractions of Dublin city, as well as tourist attractions such as Newgrange and Glendalough. Summer accommodation includes the student apartments which are self-catering. 555 of the 900 rooms are en-suite, these are located on the North Campus. On the South Campus most are single rooms, though a limited number of twin rooms are available. Traditional rooms all have wash-hand basins, with shared access to toilet and shower facilities. Rooms are a mixture of singles and twins. There are also a small number of deluxe en-suite rooms. 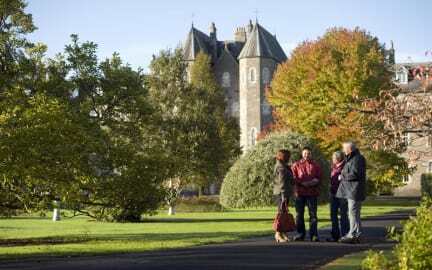 Maynooth is an ideal base from which to explore the historical treasures of Leinster. Diese Unterkunft ist sehr zu empfehlen für einen "Hostel"-Stay. Mit dem Zug ist man in 25 Minuten in Dublin.